profitable, independent creative services business. Most of all, you’ll have the confidence you need to shift into freelancing and pursue profits instead of paychecks. success as an independent creative. I was able to turn my passion for illustration and design into a long-term career, navigate changing trends and technologies, and enjoy freedom and self-determination. I will help you do the same through my Freelance Road Trip program. I’ve pulled together everything I’ve learned into this one-of-a-kind, proven road map so that you can start or fine-tune your freelance career, make a living, enjoy your freedom, and create meaningful work. Did you know that the majority of successful independent creatives started their career with a portfolio and a bunch of questions? If you’re a photographer, illustrator or designer who’s entrepreneurial, you know you need to do more than just show your work. You have to go beyond doing side gigs for friends and family. You need to be able to find the right clients, land the right projects, price your services, protect your work, and get paid in full and on time — over and over and over again. Art school helps you create an amazing portfolio. But it doesn’t teach you to run a business. You’ve probably heard about many freelancers who start out well but end up failing within in a couple of years because they don’t address the real problem. They don’t take a business approach to their business. Instead, they focus on being creative. Why’s that a problem? Because clients don’t have art problems. They have business problems. You need to solve business problems. The thing is, to make a living as a creative, you need to shift from thinking as a creative to thinking as a business owner. 1] What is the program? 2] What can I expect by the end of the course? 3] How much is the program? One of the biggest questions I get about Freelance Road Trip is, “What do we actually do in the course?" Marcus was fresh out of school with a high-quality design portfolio and absolutely no idea what to do with it. Although he found a job right away, He didn’t want to work for someone else. He was entrepreneurially-minded and wanted to start his own business. He wanted to be able to do the kind of work that he really enjoyed, live where he wanted, and be more available to his family. Marcus loved the idea of freelancing, but he didn’t know how to set up a business or how to market himself as an independent creator. Like many designers, he knew how to create stuff and had fun doing it, but he never really thought about creating a real business and learning to market himself. Lack of knowledge held him back. So he enrolled in the Freelance Road Trip course. You get 12 valuable lessons in 3 modules, delivered to your inbox. Starting with your motivations and goals, you are guided through the steps to build your business foundation. Upon completion of Module 1, you will have done the basics of setting up your business, if you do all the work. It’s not a business until you treat it like a business. Many of the potholes a freelancer can stumble into can be avoided by having the right information and a plan of action. Upon completion of Module 2 you will have established your pricing structure, created a contract template and explored copyright basics. Marketing is crucial to your professional success, and branding is necessary to promote your work. Create strategies for your web site, promotions and social media. Upon completion you will have started your prospect list, planned your website, and have a plan in place to promote your work. What is the Freelance Road Trip program? 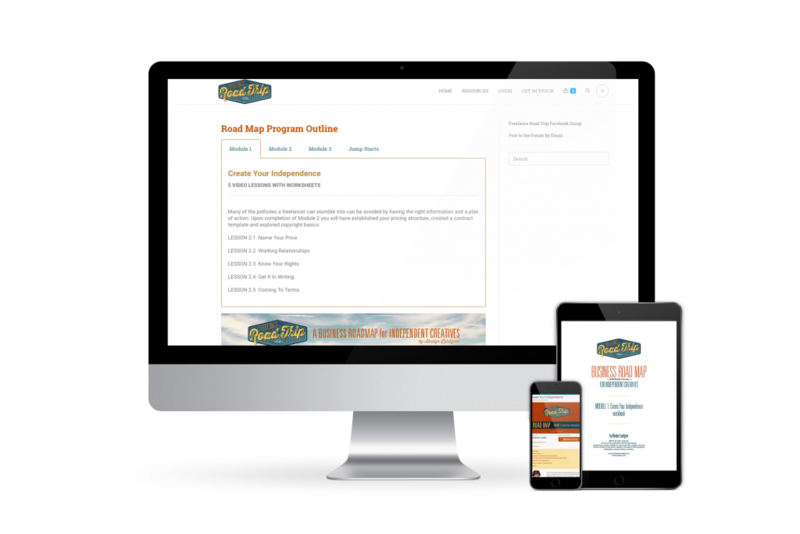 Freelance Road Trip is a complete business road map that takes you step-by-step through the process of setting up your business to generate revenue from your creative work. In as little as 12 weeks, if you do the work, you have a completed plan and are able to launch your business. Whether you’re looking to jump into full-time freelancing or pursue part-time gigs, Freelance Road Trip builds a necessary foundation for your success. The program includes of 12 bite-size video lessons delivered to your inbox once a week for 12 weeks. You get worksheets and resource guides with each lesson. Delivering the modules once a week instead of all at once allows you time to successfully complete a lesson before starting the next one. There’s no pressure to complete the program in just 12 weeks! You can take as long as you want to finish the course. There’s no expiration on it. You also get lifetime access to our private Facebook community. Share ideas. Ask questions. Get answers. Encourage and be encouraged. Form a network of fellow freelancing creatives. On top of all that, you have direct access to me via email. You start with your motivations and set some goals. We cover business set-up and policies. We cover how to find clients, manage projects, write contracts, get paid and protect your work. The program can be completed in 12 weeks. Because it's self-paced, you can take longer if you need to. You have lifetime access to the program and community. Each lesson comes directly to your inbox once each week and includes a bite-sized video, worksheet with action items and lesson notes. You complete the work at your own pace. You choose either a single payment up front of $1,275.00 or 3 payments of $450.00. The value of what you get is $3,700.00. Do you know the top 3 reasons why independent creative businesses fail? They focus on the creative work. Many creatives start working with clients before they put a business structure and policies in place. Then they run into problems, potholes and roadblocks they aren’t prepared for. Freelance Road Trip will get you as good at business as you are creatively. Because it’s not a business until you treat it like a business. They don't intentionally pursue work. Many freelancers accept whatever projects are offered instead of identifying and pursuing the kinds of clients and projects that suit them best. Freelance Road Trip provides a proven strategy for figuring out your “ideal” types of clients, and crafting tactics and strategies for consistent outreach. They don't manage the work they have. Being in business as a creative means you’re a business owner and you need to manage projects and handle clients well. Freelance Road Trip trains you in managing projects and working with clients to encourage repeat business and keep your suppliers happy. "I completed the project and invoiced the client three months ago and they still haven't paid me." "How do I know what to charge and can I bill my client for expenses?" "How do I find the kinds of clients I want to work with?" "I'm doing this job for next to nothing and it's gotten a lot more complicated than I expected. I'm worried I'm spending too much time and they keep changing their mind about what they want. " "I just found out that my photo's been stolen and someone's selling it online like it's theirs. What do I do?" "I've always wanted to be my own boss. I knew I wanted to freelance, but didn't know how..."
“I got out of school and felt really scared about how I’d make a living. A lot of my friends found jobs pretty quick, but some of them aren’t working as designers. A couple others got design jobs but aren’t doing the kind of work they want to. “I didn’t want to have to work for someone else even though everyone told me that’s the way to do it. They said to get a job first and then think about freelancing. I especially didn’t want to have to get a job at a store or bank or something while I figured out how to find some clients and start my own business. “I’ve always wanted to be my own boss. I knew I wanted to freelance, but didn’t know how. "This course has taken away my fear and confusion." ENROLL in Freelance Road Trip TODAY! Join now to get your freelance business up and running! You get weekly trainings, worksheets, Jump-Start mini-trainings and lifetime access to our online community! Enroll today! Freelance Road Trip offers a 30-day money back guarantee. Yes, you’re backed by a money-back guarantee. Over the first 30 days you’ll have received 4 modules including lessons and worksheets. Plus, when you join, you’ll have immediate access to our exclusive Facebook group. This means that you will have received valuable content and taken vital steps toward launching or tuning-up your freelance business BEFORE you fully commit. I want you to be sure freelancing is what you want to do BEFORE you join the program. But, if all you want to do is kick the tires and take it for a test-drive, you can do that. Get in touch with me, show me you’ve put in the work and how it didn’t work for you, and I’ll refund your investment and remove you from our facebook group. What's so great about the Freelance Road Trip program? Unlike many other programs, we don’t focus on one or two aspects of your freelance business. We move step-by-step through the process of setting up your business for success, protecting your work and marketing your brand. We cover the three main areas where freelancers hit roadblocks and potholes in earning income from their creative work: clients, business and marketing. Freelance Road Trip is self-paced. Although you receive a new lesson in your inbox each week for 12 weeks, you can go at whatever speed is comfortable for you. I recommend that you invest a minimum of 2-3 hours per week into building your business and getting set to launch. Consider that 24-36 hours of training is a small investment when what you want to build a long-term career. Why did you start Freelance Road Trip? Frankly, I’m tired of listening to stories and complaints of freelancers getting into trouble because they don’t know how not to. Even mid-career creative pros don’t always know what they’re doing. They encounter the same problem over and over again, and don’t have a good way of fixing it. Art schools focus on your portfolio and help you get a job, but don’t teach you how to build your brand or get a business off the ground. Frankly, out of sheer frustration, I took my own experiences and how I crafted my business and laid it out for you to follow. My aim with Freelance Road Trip is to help my fellow indy creatives thrive simply by giving them what they need and training them to use it. Will this program guarantee I'm successful? Freelance Road Trip helps you craft a successful business, but we cannot guarantee you will be successful, earn a certain level of income, or work with the best clients. You’ll learn how to structure your business, ways to promote your work, and resources for protecting your work. What you do with that is up to you. Will you help me develop my portfolio? 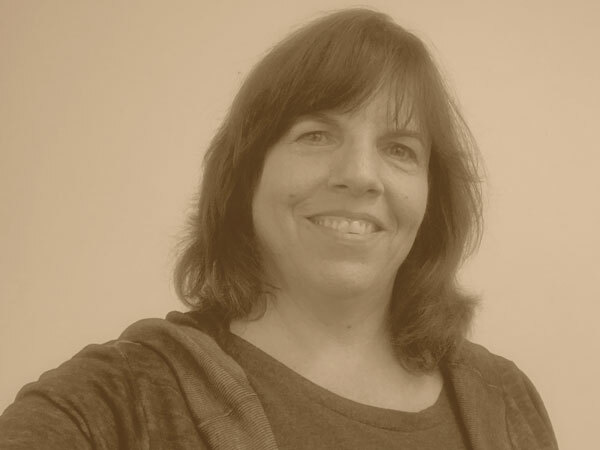 Freelance Road Trip guides you in developing business skills. These skills support your creative work. We focus more on what do do with your portfolio as a marketing tool, and what you should include in it for that purpose. Why name it Freelance Road Trip? The freelance life is a journey from one destination to another. It’s like a road trip. You map out your route in advance and get on the road. You stop at scenic overlooks and points of interest along the way. Sometimes you encounter detours and potholes. But you’re always moving forward toward your ultimate destination. Can I get my money back if I'm not happy with the program? 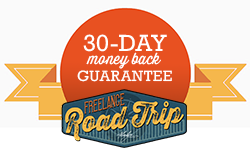 Freelance Road Trip comes with a 30-day money-back guarantee. If you have viewed the trainings and completed the exercises and it’s not worked for you, you can request a refund. Read the refund policy and instructions before enrolling in the course. If I'm a writer, will this course help me? Freelance Road Trip is designed specifically for visual communicators: designers, artists, illustrators and photographers. But most of the content is useful for writers and other types of creative entrepreneurs.